As Doug strode down the tarmac, he saw his friend and fellow aviator, Lenny. Both men had recently been involved in a highly confidential special test program on Catalina Island to undergo special combat, martial arts and counter espionage training. There, they renewed a friendship that had begun in prep school as youngsters. “Doug, great barrel roll,” Lenny teased, his brown eyes twinkling. Doug gave Lenny a friendly “hello” slap on the back, then switched subjects quickly. “Yup, Sir Galahad. He’s a great thoroughbred and probably having one hell of a time at the stud farm—I’ll bet you one hundred dollars his offspring will win the Derby this year. Speaking of which, how are the gals?” he said with good-natured nonchalance. Both men were tall, handsome, single and very popular with the ladies. “Last time we went out on the town together, you went home with the blonde AND the brunette, and I got the redhead, right? It’s true what they say about that temper, I discovered,” Doug recollected ruefully. “Next time, I get the blonde,” he said as he grinned. “Any idea why?” asked Doug in a rather nonchalant fashion. “I think it might be serious this time,” Lenny said with a faint grin. “You mean Frank Knox?” He looked seriously at Lieutenant Leonard Anderson, both losing their lighthearted demeanors as they proceeded together toward the building to meet with Secretary Knox. So, it’s time, Doug thought to himself, about time. After all, there isn’t much more I can learn doing drills. He drew himself up, squared his shoulders and marched into the building. An aide escorted them directly into the Secretary’s office, and after shaking hands, both men took a seat in the leather chairs in front of the large mahogany desk. 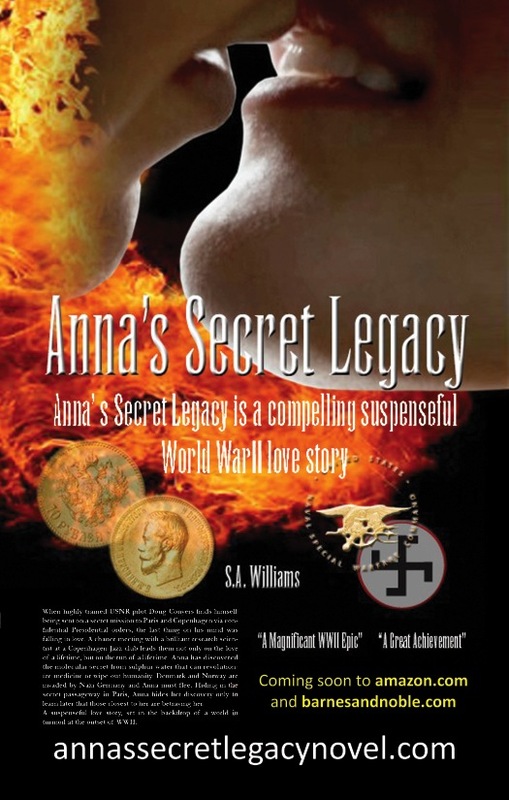 This entry was posted in Anna's Secret Legacy Blog, Banks, Chapter 5 Excerpt, Gold, Pilots, Scientific Discovery, World War II and tagged Anna's Secret Legacy, Love Affair, Molecular Secret, World War II. Bookmark the permalink.